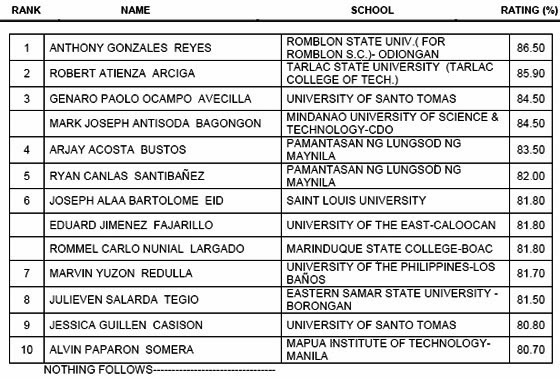 List of passers, top 10 for February 2014 Master Plumber Licensure Exam - Balita Boss! The Professional Regulation Commission (PRC) announced Friday, February 21 that 198 out of 364 passed the Master Plumber Licensure Examination administered by the Board of Plumbers in Manila, held on February 12 and 13, 2014. The PRC released the results in 6 working days after the last day of examination. Romblon State University graduate Anthony G. Reyes topped the Master Plumber Licensure Exam with a passing rate of 86.50%. Registration for the issuance of Professional Identification Card (ID) and Certificate of Registration will be on March 5, 2014. The date and venue for the oath-taking ceremony of the new successful examinees of Master Plumber Licensure Examination WILL BE ANNOUNCED LATER, PRC said. February 2014 Master Plumber board exam covers the following subjects: plumbing arithmetic, sanitation, plumbing design and installation, plumbing code and practical subjects.